The slides from my Develop 2017 talk, “From Bedrooms to Brighton”, are here. We hope to have a recording of the talk from EGX soon. The slides from my previous talk, “Rocky Road”, about how the team recovered from a bad launch, are here, along with a detailed blog post by Lee, our community manager. To find out more about GamesAid, the charity I mentioned at the end of the talk, or if you’re interested in donating game content to their new Digital For Good initiative, then please visit GamesAid.org. Five years ago we started the journey of a lifetime, one which would take us from the comfort of a fan forum through: rampant prototyping, forming a company, Kickstarter, Steam Early Access, a full release of a game, long-term support, and the sourcing an office in the heart of Brighton – all in pursuit of the single dream of a spiritual successor to Dungeon Keeper! Over time we’ve faced our fair share of challenges in getting our game, War for the Overworld, to market. In this post I’m going to share the key points of that journey in the hope that our story will help you avoid similar pitfalls, and inspire you to turn your indie team into a well-oiled machine! This is our story of taking our game from bedrooms to Brighton! Information on Josh is hard to come by, but we managed to recover the following data before his social protocols went offline: He is the managing force of the directors, a cornerstone of design, and perhaps most importantly of all: master of milkshakes. Every tale starts with inspiration and to find ours you have to wind back to 1997, when I was just five years old. This year marked the release of a game you may have heard of: Dungeon Keeper. This unique title by Bullfrog Productions and Electronic Arts, which mixed god games with RTS, was a critical juncture in our lives. Everyone on our team can relate their stories of how this game impacted their childhood, and you can read about those here. But suffice to say, both this game and its follow-up in 1999, were huge inspirations to us. Most crucially, there was a small trailer packaged on the CD-ROM for Dungeon Keeper 2, which promised a third game in the series. Unfortunately that promise would never materialise, as in the year 2000 came the news that it was to be cancelled. To fans of the franchise this was a huge blow, as it seemed Bullfrog Productions, a company we all loved, was to be restructured and reorganised to work on big-budget licenced titles. Although many titles tried to fill the gap in the genre in the intervening years, including personal favourites such as Evil Genius and Startopia, and even some crazy ones like the China-only Dungeon Keeper Online, it seemed unlikely we’d ever see the prodigal third child. Over the years much of our team came together on a fan forum for Dungeon Keeper and similar management games, called Keeper Klan. Mostly this was to be an echo chamber to voice our disappointment in the lack of a true sequel. Over time this energy became focussed into a concerted effort to develop a game of our own. But there was only one problem: none of us had made a game before! Everyone who came together in these early days was filled with optimism, and although our skills ranged from enthusiastic hobbyists to experienced modders, there was a distinct lack of experience developing a full game. 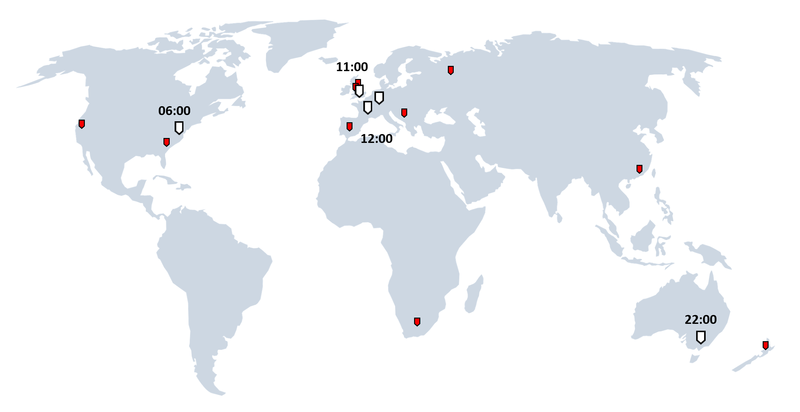 To compound issues the team was also spread across the world. Despite all that, we managed to scramble together a few prototypes. But progress was incredibly slow due to the volunteer nature of the project – most of the contributors were in full-time education or jobs. I myself worked at a milkshake bar just a short walk from where our office now stands. Eventually we realised that if we wanted to get things done, we had to get serious about the project. A big effort was made to get more organised, and this is where the game, as it exists today, truly began. We called our game War for the Overworld, in tribute to the late Dungeon Keeper 3’s subtitle. We knew that if we wanted to make this game, we had to raise enough money so that we could pay the team to work on it full time. Fortunately, Kickstarter had just emerged for games, and was proving to be a successful place for independent developers to raise funding. We immediately set about incorporating as a company, under the banner of Subterranean Games. (To our surprise it was relatively straightforward to do.) So then we set about the task of launching our Kickstarter. 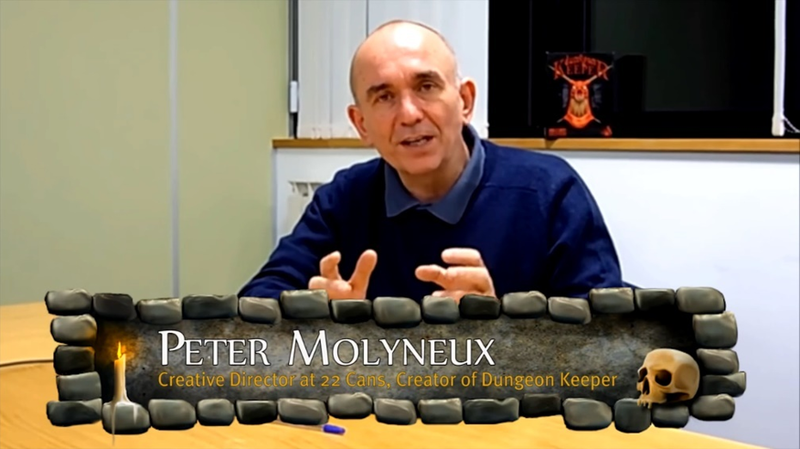 The campaign was a huge success: we raised our goal in no small part thanks to a video by Peter Molyneux (Dungeon Keeper’s original creator), which was seen by the press as a blessing. We raised a total of £265,000, including slacker backers, which seemed like a huge sum of money at the time – certainly more than any of us had ever seen before. We also came out of the experience with many promises, not least signed copies of the game (despite us all living in different countries), and physical statues (we had no idea how much they would cost to produce). But the biggest promise was the release date of August… that same year. It wasn’t long after the Kickstarter that the first cracks started to show. The then leader of the project – let’s call him “Steve” – was meant to be running development from the US; yet somehow he couldn’t seem to open a bank account to transfer the Kickstarter funds into, so that people could get paid (since everyone had now quit their jobs to work full time on the game). I ended up handling payroll myself from the UK. Steve was also the lead programmer, and the one who had proposed the August release date. Yet he had some strange ideas about the technical architecture for the game, which the rest of the code team disagreed with, and didn’t believe was achievable in the proposed timescale. Despite discussing their concerns with Steve, he continued along his path, and kept the rest of the company in the dark. This only came to light when one of the other programmers came to me directly. We had a big meeting with Steve, and the team decided that his behaviour simply couldn’t continue. And basically that was the end of Steve. Unfortunately the codebase left by Steve was largely unusable, so for all intents and purposes we had to start again. It was clear at this stage that we were now most definitely not going to hit the August release date, and that our funds weren’t going to carry us much further beyond that, let alone into the following year. We knew release had to be pushed, but we had no room to maneuver. Fortunately a life raft arrived. We’d approached Valve to see if we could do a paid alpha in advance of the game’s full release. At which point they made us aware that Steam Early Access was on the way, and they’d be happy for us to be among the first on there. This was an excellent opportunity, and gave us some much needed support over the next few months. 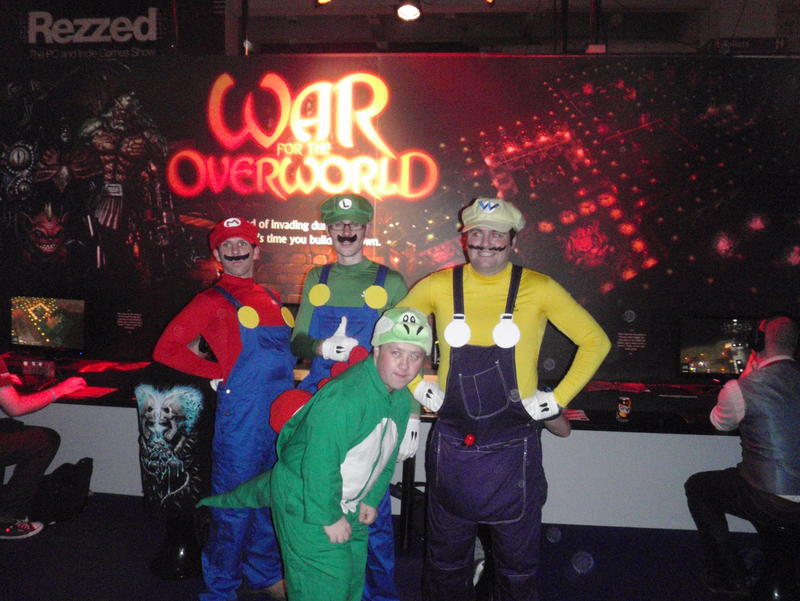 We set about trying to drum up exposure by attending events, such as the Eurogamer Expo in September 2013. Even the Mario Bros dropped by to give us their blessing! We didn’t have enough money to afford a hotel, so my parents were kind enough to put up our entire team for the week. With nearly a dozen people it was a crazed experience, with my room in the attic serving as what was essentially our first office. We celebrated this event with cakes and milkshakes, a happening that would soon become a regular ritual in our company. As the months passed and we moved into 2014 something incredible happened. We received a huge boost in sales in the middle of February, straight after the Steam Winter Sale, but eclipsing it completely. The cause? 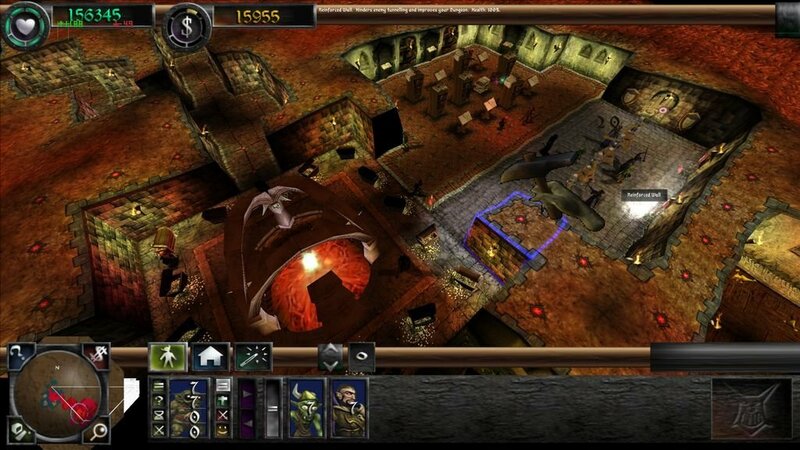 Dungeon Keeper Mobile, a game that didn’t go down too well with the fans. In response, the press, and extremely high-profile Youtubers like TotalBiscuit, pointed to our game as the true successor to Dungeon Keeper. But even after all that, by the end of 2014 the money was drying up. We had to finish the game and soon, so we put together a plan of action for our road to release. We took out loans, dropped mod support completely, had some team members reduce pay while others forewent entirely, and planned for a physical retail release with a publishing partner. In March we realised we needed as many people in the same room as possible to finish the game. We rented a rather large house in Hove, and brought team members together from all over the world – Australia, Germany, Lancashire. Working in a single space gave us the opportunity to bring the game together as much as possible in the last few months. We slept upstairs and developed the game downstairs, practically 24/7. Frequent runs to Tesco for energy drinks were made. 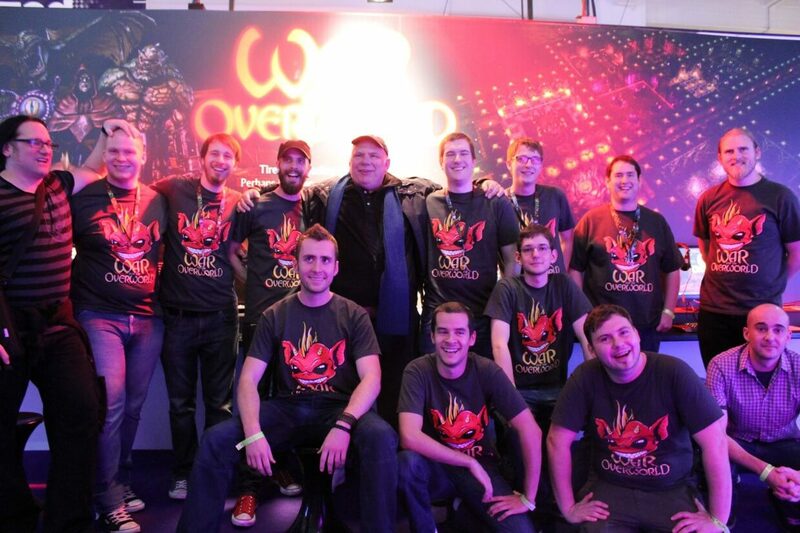 On April 2nd, 2015, we released War for the Overworld fully from Early Access. Despite all our best efforts, the game did not release at the level of quality we would have liked. Fortunately, through a sensible approach to post-release support, we managed to survive it and eventually turn things around. You can read all that in our previous blog post, “How Good Communication Can Save a Bad Launch”. But it wasn’t long until we were forced to change plans again. In October 2015 our landlord sold the house from under us, which meant we had to pack up both our lives and our work. For some of us like me that meant returning home temporarily – something my cat loved but my parents less so. The company itself was homeless, and although we continued working from our various accommodations, something better was drastically needed. We spent our homeless time wisely. While most of the team continued work on improving War for the Overworld, the rest of us set about trying to find an office. We also decided that the Subterranean Games name no longer represented who we were, nor our now wider aspirations, so we incorporated once more as Brightrock Games. Within a few months we had located what would soon become the home of Brightrock, right in the centre of Brighton (and which turned out to be Eurogamer’s old office!). It took us a total of six months to completely sort the lease! With investment from Coast to Capital we set to work investing in the office itself. We knew we wanted to make this place not only a workspace, but also a relaxing home from home as well. After all, many of us had been working from home this entire time, or indeed in a home that served as an office. The office underwent some serious refurbishment, all while we were working! We spared no expense, getting a fully-equipped kitchen, air conditioning (which as I write this in the heat of summer I’m very thankful for), and projectors for our main meeting room and gaming room. All the while work has continued on War for the Overworld, which after two years on from release now stands as not only a dungeon management game we can be proud of, but we hope a worthy successor to Dungeon Keeper as well. Naturally we’ve celebrated many times with cakes and milkshakes. Now as we start to wrap up on War for the Overworld, we’re looking towards the future with two different titles in the works. We hope to share details on those soon. So What Did We Learn on This Journey? Be sure of your team – Take a hard look at your team, especially the people in charge. Make sure they know what they’re doing, or at least have the capacity to learn. Share responsibility – Ensure everyone is involved in the major decisions and planning. Don’t just assume everything is fine and dandy. Plan together – Make sure you’ve got the resources to make the game, and don’t leave all the planning up to one person. Get help – Talk to other devs. Get a lawyer and an accountant (or at the very least start talking to these people). Keep your end goal in mind – Know your end goal and ensure all decisions are aimed at that. Keep talking to your fans (especially when things go wrong!) – If you communicate clearly with your fans and take ownership of your failures, they will often forgive your mistakes. And remember: your mileage may vary. There are so many different scenarios to be in that there’s no guide to doing things the right way. You may have a bigger or smaller team than us, less or more resources, or be making an entirely different kind of game. But nevertheless, I hope there are some useful takeaways here, and that it has inspired you to never give up on your goal. Interesting read.Looks like there are many times you could have thrown in the towel but you didn’t and we ended up with an awesome game in the end. Kudos to you all for persevering. In the end I’m extremely happy I donated to this project. I definitely look forward to supporting and playing future projects! Thanks Jason! We really appreciate all the support our backers have given us over the years, your patience with us has known no bounds! I bought MPD dlc only because your like real humans and you communicate a lot via steam with your community. What would be awesome, if you could start a weekly blog for your next project like the dev of Factorio (check it out Friday Factorio Facts, also recommend it strongly to your programmers, the dev talks a lot of maximum performance improvement, very interesting to read). Also check out Godot Engine, new free and super good. 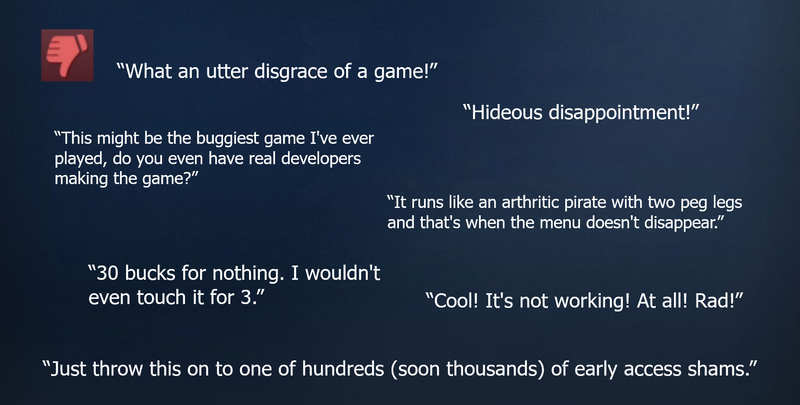 Please don’t do games with unity. We actually used to run weekly blog posts up until the release of Patch 1.1 I believe. In total, we ran 129 posts until the final one in June 2015. We’d definitely be open to doing the same again for our next project but we can’t say exactly whether that would ultimately be a strategy we decide to follow. It can be quite difficult to keep up with the pace while providing solid quality, informative, digestible and interesting news that everyone wants to hear. There’s rarely enough done in a single week that can be revealed to the average customer and keep them interested on a week-in, week-out basis. Though I definitely recognise some more technically minded people would be interested in a more… raw… look at the events of the week. In any case, it’s definitely a great way to involve the community. So I guess the short answer is, we’ll see. There’s a lot to factor in and maybe even better ways to do it that work best for us and our community at large. I was 17 when BullFrog’s Dungeon Keeper came out and this game instantly became one my favorite games ever. I bought the 2nd opus which contained the famous DK3 trailer day one and I remember, a few years later, how disappointed I was since the third Dungeon Keeper never came out. I remember when WFTO first appeared as a failed attempt to give us this so waited spiritual sequel. Never mind, at this moment I put it in my wish-list thinking “we’ll see later” and then I kinda forget it because the PC I was using wasn’t enough powerful to make it run. Last November, in 2017 then, my 10 years old assembled by myself PC finished by dying but fortunately, since summer the same year with that question in mind, I had some spared money in order to buy a new one. Unfortunately, I haven’t enough to acquire the configuration I wanted and so I had to wait even more (until January 2018) before I finally put on my actual machine for the first time. This is when I remembered I had a lot of games I wanted to test before without being able to launch them. With this brand new PC it became possible so I started to buy many many games via Instant Gaming (sorry for the ad) included War For The Overworld. All this to say that I’m lucky because when I started to play your game, it was right after the bad period and I instantly retrieved similar sensations from those I experienced when I beat DK, DD & DK2. All this to say I feel myself playing Dungeon Keepeer 3 when I play WFTO. I love your game so much that, a very few time after I started it, I almost instantly bought all the DLC I could. And right now, waiting for the last hour remaining before The Under Games release to pass, I’m typing this little long “short” message. For the young guy hoping for a DK3 to come one day I used to be, I thank you, all of you. PS. Please excuse my possible mistakes, if any, in English. Just know it’s not my first language (which is French). PPS. I remembered having stayed in London, a scholar journey, when I was 12 or 13. And the day we came from France (before Eurotunnel) we took the ferry from Calais to Brighton. And we waited a little for a bus before leaving Brighton to London. At this precise moment I remembered playing Street Fighter 2 in an arcade place just right next to the sea. Only to say I have a good gaming memory which takes place in Brighton, maybe 5 years before Dungeon Keeper. Hi Axl RAID, sorry for our late reply. I think your message must have gotten lost in the busy time at The Under Games launch! Thank you so much for supporting our game, and for sticking with us. And thank you also for sharing your fond memories of Dungeon Keeper – we certainly have a few of those on our team (and for some of us, fond memories of playing Street Fighter 2 in the arcade too! ).